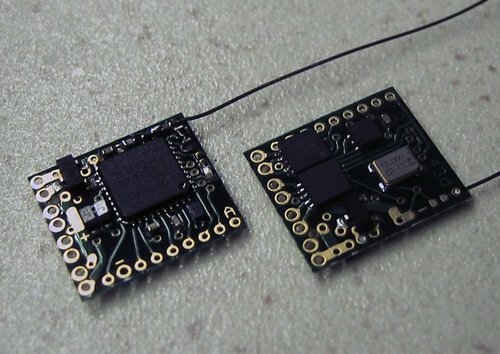 UK designed and manufactured DSM2/DSMX ultra micro 2.4GHz receivers with outputs suitable for driving magnetic actuators (and some also with servo outputs). All of these receivers are fully compatible with Spektrum, E-flite, Parkzone and other DSM2/DSMX 2.4GHz transmitters and transmit modules. These receivers are not copies of Spektrum products. All of the receivers have twin built-in 2A brushed ESC, which can be used for thrust steering. The throttle signal is available so you can connect an external ESC. If you do use an external ESC, simply ignore the brushed ESC output(s). These receivers are designed for aero models. If you are looking for receivers with fwd/rev ESC for vehicles, boats, trains then take a look at the 'v5' and Rx6x receivers. All actuator receivers have outputs via solder pads at 1.27mm spacing allowing the use of standard 1.27mm (0.05") sockets for attachment of actuators and/or motor(s). 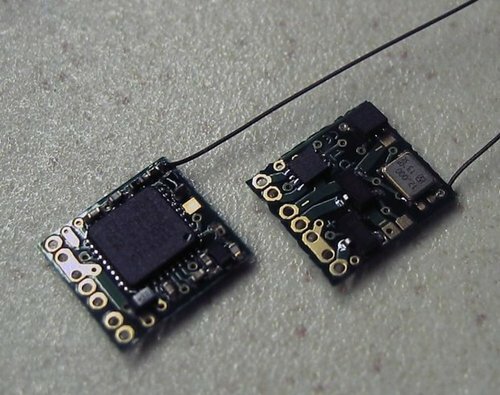 Rx41d and Rx43d use the A3901 H-bridge driver chip and are capable of supplying 400mA per channel. Rx41d is a DSM2/DSMX compatible 4 channel micro receiver with one actuator output, 3 servo outputs and twin built-in 2A brushed ESC. The actuator channel may be connected to aileron, elevator or rudder - it can also be used to drive a motor with bidirectional control. The rudder or aileron channels may be mixed into throttle for differential thrust steering. Twin throttle signals are also available for driving external ESC. Download the Rx41d user instructions. Rx43d is a DSM2/DSMX compatible 4 channel micro receiver with three actuator outputs, 3 servo outputs and twin built-in 2A brushed ESC. The rudder or aileron channels may be mixed into throttle for differential thrust steering. Twin throttle signals are also available for driving external ESC. View the Rx43d user instructions (v3.44).